ROCKS and MOUNTAINS FELL, but they fell on "Blind Guides" and sold-out Theologians! These Bible Codes ["Pesher"] have been corrected to reflect the latest information as of December, 2002 -- that Jesus Christ lived in Kashmir and India before and after his 3 1/2 year "reign" in Judea and Qumran between 29 and 33 AD. "It is at midnight that God manifests His power for the deliverance of His people. The sun appears, shining in its strength." Rev. 6:13 "And the stars of heaven fell unto the earth-- 14 And the heaven departed as a scroll-- and every mountain and island were moved out of their places." "The wicked look with terror and amazement upon the scene, while the righteous behold with joy ...their deliverance....In the midst of the starry heavens is one clear space ..whence comes the voice of God---"
The "Earthquake" of Rev. 6:12 is the Atomic Bombs that ended WWII. The "Voice of God" of GC ch. 40 is also the Atomic Bombs that ended WWII. 17 For the great day of his wrath is come: and who shall be able to stand?" became known as the "Dead Sea Scrolls". known parables -- the "Treasure in the Field". Matthew 13:44 "Again, the kingdom of heaven is like unto treasure hid in a field; the which when a man hath found, he hideth, and for the joy thereof goeth and selleth all that he hath, and buyeth that field." roof was shaped like the lid of a pottery jar! Adventists waited for their Jesuit instructors at Notre Dame to tell them what to do with the Essenes and the Dead Sea Scrolls. ...They still are waiting! of the real Jesus Christ! to browse at a link at the end of this page. as if nothing of this kind had been discovered! Matthew 24:25 "Behold, I have told you before. behold, he is in the secret chambers; believe it not." always be cautious of the claims of a newcomer. But using the techniques called "Gospel Pesher"
there originally for us to read and understand. these words being said by those that say them! and had Matthew write it down 1900 years before it happened! Matt. 24:26a "Wherefore if they shall say unto you, --"
new discoveries "not authorized by popes, and councils, and decrees". speaking supposedly to a group of hearers in Jerusalem by the temple. present "Blind Guides" are denying to all who will listen! neighborhood! ..No more fat pay check!... No retirement villa! Matt. 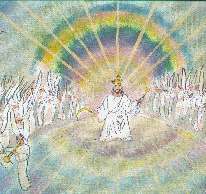 24:26d "behold, he is in the secret chambers--"
the Essenes planned for them to have! again! ....Or hire some Mafia hood to do it for them! I, Jesus, am telling you in 33 AD, that when the Church authorities intent on crucifying me now [33 AD] have passed on, they will be followed 1900 years later by Church authorities just as malicious and self-serving of their own interests! As the crucifying Romans will discover that I am just a MAN -- a man that can bleed when my side is pierced, that will cry out in pain and despair, and then become unconscious -- so will this later group at Qumran discover again that I was just a MAN -- an Essene who got most of my teachings from sectarian literature. This will not by then fit their AGENDA, so they will deny all this new evidence, and explain it all away. ...I, Jesus, have predicted this....And it shall come to pass just as I have said. For further study along lines that only were sampled on this page, click a topic below!